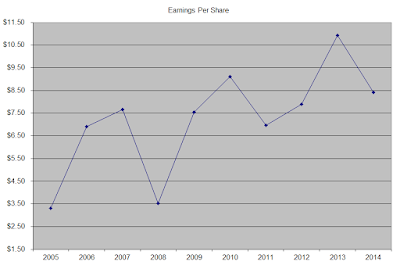 The company has managed to deliver an 8.10% average increase in annual EPS over the past decade. ACE Limited is expected to earn $9.18 per share in 2015 and $9.50 per share in 2016. 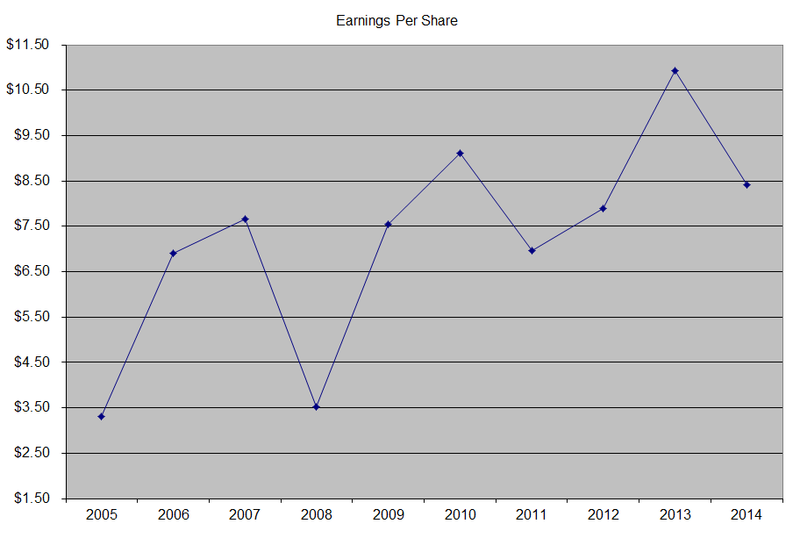 In comparison, the company earned $8.42/share in 2014. Earnings per share for property & casualty insurers tend to be lumpy, driven by the cyclical nature of insurance premiums. As a rule, these premiums are highest after major catastrophic events have occurred, and lowest right before the next catastrophe happens. The Property & Casualty insurance business is very competitive, and is subject to price competition for a commodity product. Companies have the incentive to keep writing policies, even if premiums might not justify taking those policies, in order to keep market share. It takes a certain type of management skill to be able to only write policies at advantageous terms for companies, rather than mindlessly change growth. One way to evaluate P&C insurance companies is through the combined ratio, which is a measure of insurance companies performance. The combined ratio is calculated by taking the sum of incurred losses and expenses and then dividing them by earned premium. A combined ratio below 100 shows that the company collected more than what it cost it to pay out. The thing that every insurance company in the world is after is investment float. Float represents insurance premiums collected, that are not paid out yet. The insurance company gets to invest and earn a return on that sum. The insurance company has to be very conservative in how it invests that money, because usually it ends up paying out in claims as much as it collected in premiums. Only good managers tend to earn an underwriting profit, by consistently paying out less in claims than what they received in premiums. I stumbled upon ACE, after waking up to the news that the company is acquiring Chubb (CB). After reviewing the information from Ace, I believe that I am going to exchange my shares in Chubb for ACE. In addition, I will also exchange any cash I receive for more shares of ACE. A bet on ACE is a bet on the company’s CEO, Evan Greenberg. He is the son of Hank Greenberg, the legendary CEO of AIG. He has insurance running through his veins, and seems to have a good handle on things based on his past track record. I like the fact that he grows through acquisitions of good assets such as Chubb (CB). He doesn’t seem to be overpaying for the business, which should be accretive to shareholders. In addition, I like the fact that a large part of the acquisition will be paid in cash, which reduces dilution for existing ACE holders. As a holder of Chubb, I am not that happy with the cash, but at least I get to earn a good return in a short period of time. As an added bonus, rising interest rates are good for insurance companies like ACE. This is because the rising interest rates will mean higher returns on fixed income investments they make in the future. The annual dividend payment has increased by 14.60% per year over the past decade, which is higher than the growth in EPS. 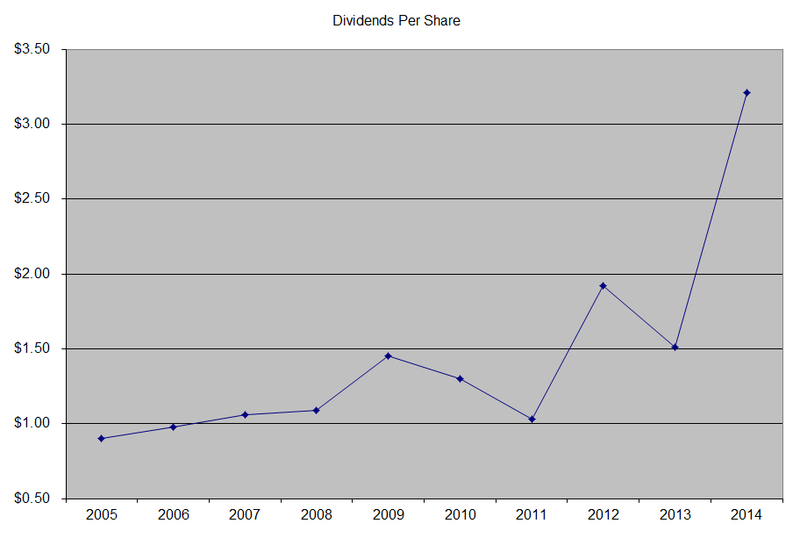 I would not bet on future dividend growth exceeding 8%/year. A 14% growth in distributions translates into the dividend payment doubling almost every five years on average. 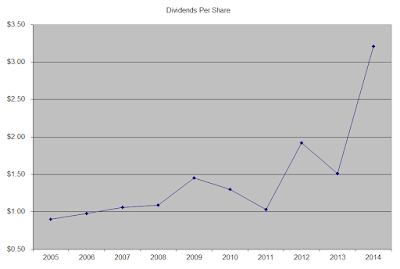 If we check the dividend history, going as far back as 1995, we could see that ACE has indeed managed to double dividends every five years on average. In the past decade, the dividend payout ratio has largely remained between 13.80% and 30.80%. The current payout ratio is high at 38.10%, but on a forward basis it is much lower. A lower payout is always a plus, since it leaves room for consistent dividend growth minimizing the impact of short-term fluctuations in earnings. 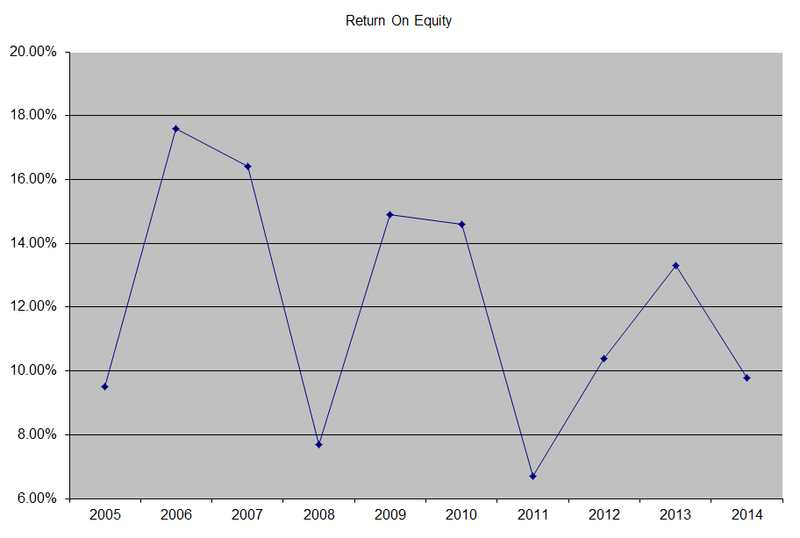 Return on equity has been dropping over time, from a high of 17.60% in 2006 to 9.80% in 2014. 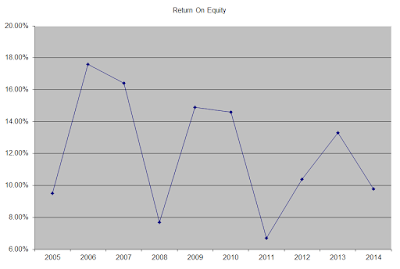 I generally like seeing a high return on equity, which is also relatively stable or rising over time. Currently, I find the company to be attractively valued at 11.30 times forward earnings and an yield of 2.60%. I am actually considering initiating a position in the stock, subject to availability of funds.